On Saturday, September 29th, after tailgating at 1pm, the Highland Park Scots football team walked out of the school building while the cheerleaders cheered for them. 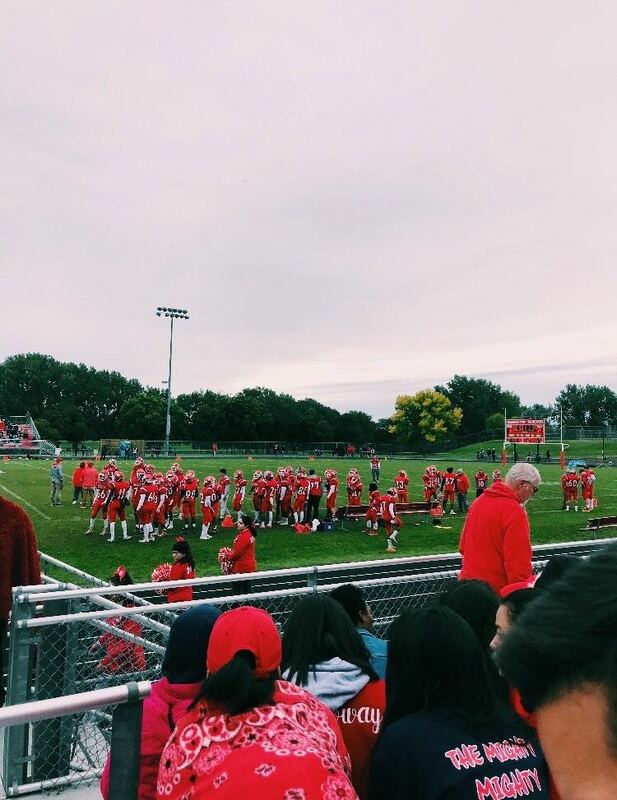 Then they headed to the stadium to play against MSB (Minnehaha, SPA, Benilde St. Margaret). After that, they started to warm up and get ready. The game began and Highland started off well, but later on, the other team made a comeback. In the bleachers you could see the crowd cheering loud for Highland. Most students had their faces painted and wore red clothes. That day was very cold many people had blankets. Also, during the game concessions were selling hot chocolate to help people stay warm. 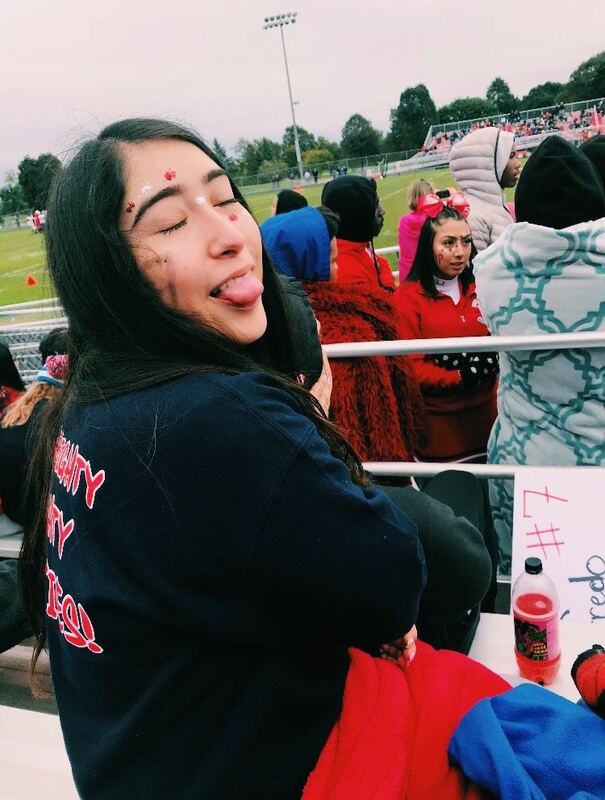 When you saw the cheerleaders, many of them were wearing sweatpants and sweaters underneath their uniforms since the day was pretty cold. The cheerleaders still brought out the school spirit. You couldn’t enjoy the game a lot because of the weather, and most people ended up leaving early. A player from the Highland Park side name Dawit got a concussion after getting hit by another player from the other side. The players on the other side were big compare to the Highland Park players. They were harder to tackle and throw. The game ended with Highland losing and MSB winning 35-6. Here are next week’s scheduled events. Those hosted at Highland Park H.S. are in bold. We hope you will attend the events of your choice and support our student athletes. Bus times are noted for away games. 4:30 pm Adapted Soccer – PI: Varsity Game St. Paul Hawks vs. Mpls. Adapted @ Minneapolis South HS. 5:30 pm Volleyball: Girls C Squad Match Vs. Humboldt @ St. Paul Highland Park H.S. 5:30 pm Volleyball: Girls JV Match vs. Humboldt @ St. Paul Highland Park H.S. 7:00 pm Volleyball: Girls Varsity Match vs. Humboldt @ St. Paul Highland Park H.S. Well, the Browns managed to mess up their draft again. The Browns are gaining a track record of drafting quarterbacks who have off the field problems. The Browns drafted Johnny Manziel only a few years ago. Manziel is still trying to work his way back into the NFL. The Browns could have easily taken running back, Saquon Barkley, with the first pick and taken Mayfield three picks later. The New York Giants ended up getting Barkley, from Penn State. Barkley has wowed the NFL scouts with his combination of speed and cutting ability. Running backs in the NFL now have to be able to block, run, and receive passes. This is why Barkley will make a great NFL player. One of the biggest stories in the draft was the potential selection of a one handed linebacker. Shakeem Griffin was drafted in the 5th round by the Seattle Seahawks. It just so happens that his brother is also playing for the Seahawks. Griffin has been through a lot. If he had been born with two hands, he might have been a first round pick. If I know anything about Griffin, it is that his low draft selection will only fuel his in his future career. The NFL Draft is always very interesting, but the best part of this year’s draft was probably when the Eagles’ former kicker stood in front of Cowboys fan and pointed out to them that the last time they (the Cowboys) won a Super Bowl, the current draft format was not even in existence. Sports are fueled by competition, and sparking more hatred from the Cowboys fans may be the best way to insure that you will lose to them the next season. The draft is over, and I for one am ready to see the season start back up. We have an interesting new crop of rookies, and with any luck they will add some intruding to this already interesting season. The NFL free agency started of with a few key players moving around. First, the Denver Broncos signed quarterback Case Keenum. The Broncos are hoping that Keenum can emulate his success from last year, where he lead the Minnesota Viking to a heartbreaking NFC Championship game loss. The Viking continued the theme of losing all of their quarterbacks as Sam Bradford signed with the Cardinals and Teddy Bridgewater signed with the Jets. The Vikings picked up Kirk Cousins from the Redskins. 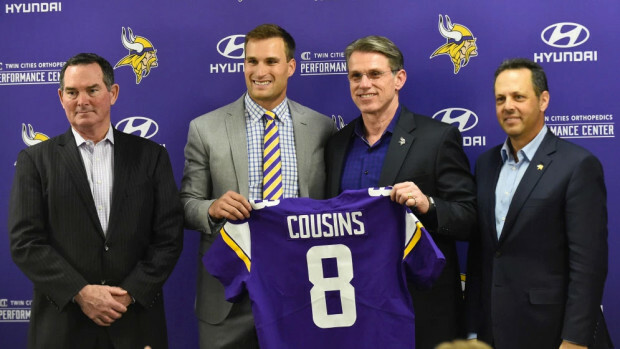 The Vikings believe Cousins can be their quarterback of the future. Drew Brees also re-signed with the Saints. This move keeps New Orleans in the hunt for the playoffs and maybe the Super Bowl. This free agency shook things up quit a bit. Above were the big moves made by teams, but every team made moves that will be significant next year, whether we know it or not. NFL teams are still signing players in free agency even though all the star players are signed. At this point of the year, teams are looking to fill in holes in their team. Most of those holes are at positions like offensive lineman, and getting a third cornerback that fits your system. After free agency, teams look to secure their future through the draft. The draft allows teams to take risks, and potentially draft a star player. 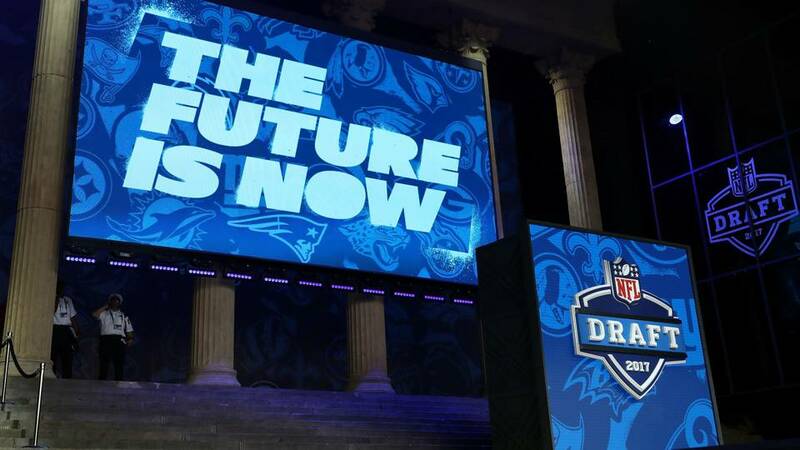 Some teams will be making smaller moves later in the draft while other teams such as the Cleveland Browns will be attempting to draft a franchise player in order to give themselves a glimmer of hope that things will get better. Now that the NFL regular season has come to an end, the most exciting part of the season is upon us: the post-season playoffs. The playoffs are where the biggest of fans either gather in stadiums packed to the brim, or sit down with friends and family to cheer on their favorite teams and hope that a Super Bowl win will be coming their way. This year, a few teams have come back for yet another playoff appearance, and also some teams have the chance to show that they have what it takes to make it with the “Big Boys” of the league. The first and second round of the playoffs have been extra packed with upsets and close games. First off, the teams that made it to the playoffs this year were mostly expected to make it. From the AFC, the teams that made the playoffs were the: Tennessee Titans, Kansas City Chiefs, Buffalo Bills, Jacksonville Jaguars, Pittsburgh Steelers and the New England Patriots. From the NFC was the: Atlanta Falcons, Los Angeles Rams, New Orleans Saints, Carolina Panthers, Philadelphia Eagles and the Minnesota Vikings. All teams played Wild Card weekend, except the Vikings, Steelers, Eagles and Patriots. The Eagles placed #1 in the league, with a record of 13-3, and tied with the Vikings for best in the NFC, also with a record of 13-3. The Patriots and Steelers tied for best in the AFC with records of 13-3 too. In the wild card games, the Titans took on the Chiefs, and won in a close game 22-21. The Falcons took on the Rams, and won 26-13. The Jaguars and Bills played a slow-paced game, and the Jaguars came out with the 10-3 win over Buffalo. The final wild card game was between the Saints and the Panthers. The game came down to a Panthers defeat when the Saints were able to gain a 31-26 win over Carolina. The divisional round of this year’s playoffs contained lots of surprises. On Saturday, January 13th, the Eagles were able to come back and defeat the Falcons in a 15-10 victory, and the Patriots used Tom Brady to crush the Titans 35-14. On Sunday, the Jaguars were able to defeat the Steelers in a high-scoring game 45-42. This year’s playoffs have seen a crazy bunch of games, and fans are closing in to see the super bowl matchup. As a Vikings fan myself, I am hoping that the Vikings can come home and win our very first Super Bowl in our home stadium. 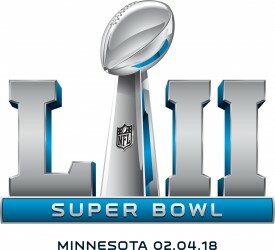 Minneapolis will be hosting Super Bowl LII in the new U.S. Bank Stadium, Sunday, February 4 at 5:30 PM CT. The Super Bowl is the final game of the NFL season, played every year for the past 52 years in a different state, and is the biggest annual sporting event in America according to Sports Illustrated. This is the second time Minneapolis has hosted a Super Bowl; they also hosted Super Bowl XXVI in 1992. 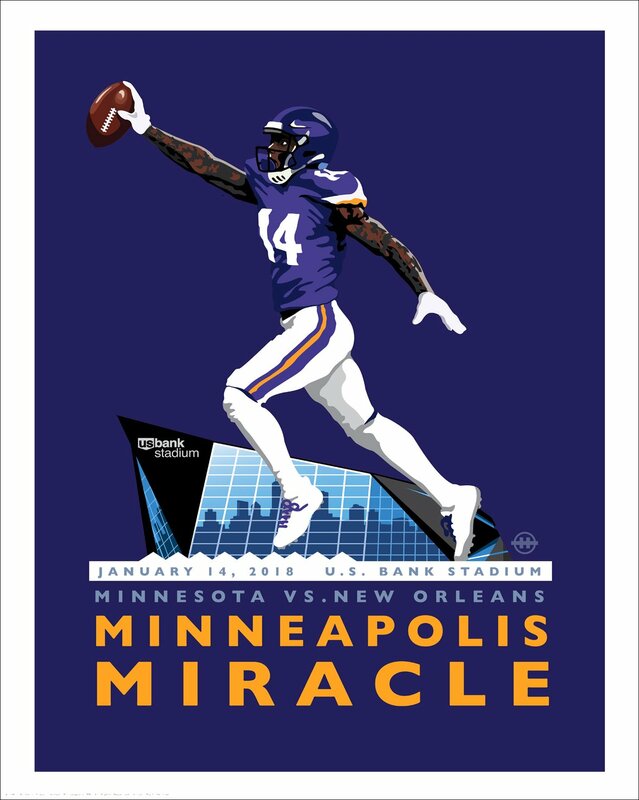 It was first announced that Minnesota would be hosting in 2018 in 2013, just after the Minnesota Vikings went 5-10-1 (5 wins, 10 losses, and 1 tie in a season). Since then, the team has improved tremendously, going 7-9, 11-5, and 8-8 in 2014, 2015, and 2016 respectively (Check out Pro Football Reference for more stats). We will not know who will be competing in the Super Bowl until the end of the playoffs, which continue on January 13, and end on January 21. It is possible that the Vikings, who are headed to the playoffs with a win-loss ratio of 13-3, will make it to this Super Bowl, and as MPR reported, it would be the first time in over 25 years that a Super Bowl participant would be competing in their own state. As MPR points out, if the Vikings can survive the playoffs by defeating the New Orleans Saints, and then winning their conference championship game, they will become the first franchise in NFL history to play a Super Bowl in their hometown. It would be the team’s fifth Super Bowl (their last was in 1977), having won not a single previous one. But, while this may sound nice to Vikings fans, to the organizers of Super Bowl LII, it could create a great “headache,” according to Sports Illustrated. Hosting a Super Bowl is already a technical feat, but the logistical problems that would arise from the Vikings reaching the Super Bowl would make it even more impressive. Just by making it this far, the Vikings must host a divisional-round game at home on January 14, making it the first time a Super Bowl host city has also hosted a divisional-round game, and if Philadelphia loses, the Vikings will also host the NFC title game. According to CBS Minnesota, Downtown Minneapolis will be revoking parking permits in the area on the day of the game, in order to free-up parking space for attendees. If the Vikings do make it to the Super Bowl, the facilities which they, and their competitors use, will have to be swapped, to allow the Vikings to use their home facility as noted by Sports Illustrated. The Super Bowl is more than just an annual football game and cultural event. For local and national businesses, it is a big commercial opportunity. It receives 100 million American viewers annually, more than three times more than the Oscars, the second largest TV event in America. Thus, the cost of a Super Bowl advertisement is roughly $5 million for a thirty-second spot, not including PR, digital promotion or contests. In total, a good campaign can cost around $10 million, according to Forbes. A pop-up marketplace called North Local Market, displaying over 20 local brands, will be set up in City Center in downtown Minneapolis, from January 26 through the Super Bowl (for more information see the Minneapolis/St. Paul Business Journal). But, not everyone is happy with the Super Bowl. According to the Minneapolis StarTribune, A coalition group has organized a protest march on the day of the game, from Peavey Park to U.S. Bank Stadium, in a route as of yet unrevealed. Activist Jess Sundin, a head organizer, said she expects to see “several hundred protesters.” They will be protesting against, in their own words, the “racism and corporate greed,” they perceive in the Super Bowl and the various side-acts connected to it. Individuals interested in attending Super Bowl LII, who do not already have tickets, will be disappointed; the going price on StubHub, one month away from the game, is upwards of $3,200. Fortunately though, according to MPR, the Super Bowl host committee has announced Super Bowl Live, a 10-day festival leading up to Super Bowl Sunday. It will be held outside in Nicollet Mall, and will include free concerts, ice sculptures, and food. The Vikings must win only two more games in order to make it to Super Bowl LII, and fans will be impatiently waiting until they next play. If they do make it, it will be a historic moment for the Vikings, the NFL, and Minnesota. If they win the Super Bowl, it will be a historic moment for American sports history in general. On Saturday, October 7th, 2017, Highland Park Senior High inducted the following individuals, and teams, into the Athletic Hall of Fame: John Heller, Louise Kramer, Charles Portis, Gary Podas, the 1999 Basketball Team, and the 1977 Volleyball Team. 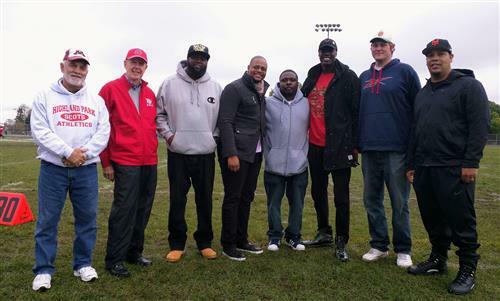 All of the inductees that were inducted into the Highland Park Athletic Hall Of Fame had notable accomplishments in their sports, while also helping the school thrive. We attended the luncheon on Saturday morning, and listened to the various inductees and what they had to say. The first inductee was John Heller. He served as Head Football Coach from 1985-2000 and as the Athletic Director from 1995-2009. He did not say much about his accomplishments as the Highland Park football coach, but focused more on his amazing achievements as the Athletic Director. In an approximately 15 minute speech, he gave the audience a great story of how he was able, with the help of many parents, students, and teachers, to add on a field house to the school, and help install brand new lights onto the football field. The next inductee was Charles Portis, and the 1999 Boys Basketball Team. Charles Portis was a school counselor and coached boys basketball from 1989-2010. He helped lead the 1999 Boys Basketball Team to a great season and a state title. Next up, was Louise Kramer and the 1977 Girls Volleyball Team. No one from the 1977 team was able to attend the luncheon, and neither was Ms. Kramer, but we did get to hear a few words of their accomplishments, including a quote from Ms. Kathleen Kramer (who is not related the coach of the 1977 Volleyball Team) “The team that year went 6-0 in conference and went on later that year to win the state tournament with coach Louise Kramer.” Kramer coached from 1972-1978. The final inductee was Gary Podas, who is the current golf coach at Highland Park Senior High. He has been the coach of the boys golf team since 1979, and has lead numerous boys golf teams to conference titles and state. He is the longest serving coach in the SPPS district.